The electro-acid blade etching process uses acid and a controlled electric current through an etching master to "mark" knife blades with a design or logo. Combine your company logo with any of our stock blade etches to create your own. Best copy is logo and up to 2 lines - 4" minimum size artwork required. Custom etching masters are 1 size, if different sizes of knife blades are to be etched, more than one etching master is required at the additional cost of $100.00 (G) each. Custom blade etching masters are $100.00 (G) each. No running charge, No minimums. FREE blade etching from any of our stock blade etches. No set-up fee or per piece running charge when using any of the stock blade etching masters above. No set-up, No running charge, No re-use charge, No storage or maintenance fee. 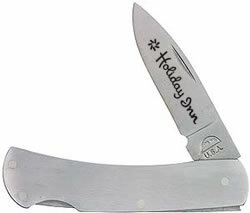 Additional blade etches on multi-blade knives, backsides of the same blade, a stainless steel knife handle are an additional $1.00(c) per piece. An etching master for each location is required if the 2 etches differ in copy or size. Blade etching may be combined with Award Inlays, Rotary Engraving, Laser Engraving, and Diamond Engraving. Knife blades are the best place to display your message . The dark etching mark made from our etching process has a long life. The etch is not on the surface but into the metal blade. Many people think of it as "dye" is to carpet. An etching master is required for any etch or mark to be applied to a blade. Size of the blade etching masters can not be changed nor can the master be adapted by additions or deletions. Each different mark requires its own etching master. The blade etching process differs greatly from other forms of customization in that the size and copy can not change. For best looking results we suggest a logo and company name along with the company motto or location. Other good marketing tactics are adding the current year or serial number to create a "time marked" piece for each recipient. Any ferrous metal that includes stainless steel, carbon steel, titanium steel or chrome vanadium and is bead blasted, satin or mirror polished. Materials that can not be etched are plastic, wood, rubber and non-ferrous metals such as brass or nickel silver. Brass and nickel silver are common bolster materials and cannot be marked via our electro chemical etching process. We suggest engraving for bolsters. For more information on knife bolster see our engraving page. During the electro acid etching process knife blades are inserted point first into the different etching acids, then into neutralizers, cleaning solvents, and oil preservatives. They are then placed on points end to drain and dry. It is not possible to submerge an entire stainless steel knife handle using this procedure. These various solutions would be trapped within the interior of the body of the knife frame and could result in future corrosion problems. Cleaning the knives as they are being etched is the only way to safely accomplish this task. The cost of additional personnel to clean the handles is reflected by the $.75(c) per piece cleaning charge . Some blades are too small to accommodate our stock blade etching masters. However blades that have been designated as too small for our stock blade etching masters could be etched with custom logos with the fabrication of a custom etching master.